We had more ideas on how to use chess strategies to improve your finances than we could fit in the print version of Rich As A King. To thank you for purchasing the book, we made some bonus ideas available online, just for you. If you enjoy reading them, you probably will also enjoy learning more ideas about how to be a strategic investor in our blog and podcast. Sign up here. 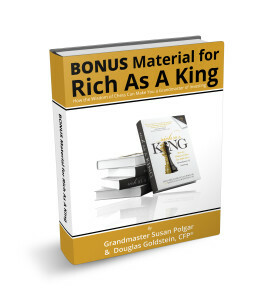 Click on the individual sections below, or download all the Rich As A King bonus material in an e-book, by clicking here.